The Lance Armstrong Foundation is a valuable resource for those living with cancer and their families. Lance Armstrong has devoted his life to help others overcome the challenges he has also faced in life by being a cancer survivor. By the time he turned 25, Lance Armstrong became one of the best cyclists in the world. He won World Championships, multiple Tour de France stages, and many other competitions. In fact, he is the only person to win the Tour de France seven times. The future was bright and looked exciting for this race enthusiast. At the height of his race career, he was diagnosed with cancer. A challenge he did not expect. He went through aggressive treatments and became a survivor. This led him to create the Lance Armstrong Foundation and become an advocate for people living with cancer. His motto is LIVESTRONG and he lives by it to the fullest. The Lance Armstrong Foundation is a nonprofit organization that was founded in 1997 by Lance Armstrong. The mission of the Foundation is provide support for those living with cancer and for their families. Based in Austin, Texas, the Foundation works globally to provide information and give support to those affected by cancer. The Foundation has raised more than $180 million for cancer programs and initiatives. The goal is to make cancer a national priority and ultimately to find a cure. The National Action Plan for Cancer Survivorship was created to help doctors, caregivers and health organizations understand and recognize the needs of those who are cancer survivors. The Community Program supports local programs that provide survivors with services that are direct and easy to access. Survivorship Centers support various cancer centers nationwide and strive to unite them on a larger scope to initiate change. Research is funded by the Foundation in the areas of cancer survivorship. The Young Adult Alliance brings organizations together in order to recognize the needs of young adults who are living with cancer. Internships at the Foundation are offered non-paid to students wanting to get experience in nonprofit organizations. Office volunteer opportunities are available to those living in Austin, Texas during daytime, evening, and weekend hours. Making a donation either online, by phone, mail or wire transfer. Donating in honor or memory of someone special and they will receive a special card from the Foundation. Supporting the Foundation's events by donating to support one of the participants. Wedding donations can be made to the Foundation in lieu of traditional gifts. You can also show your support by wearing one of the official yellow LIVESTRONG wristbands. 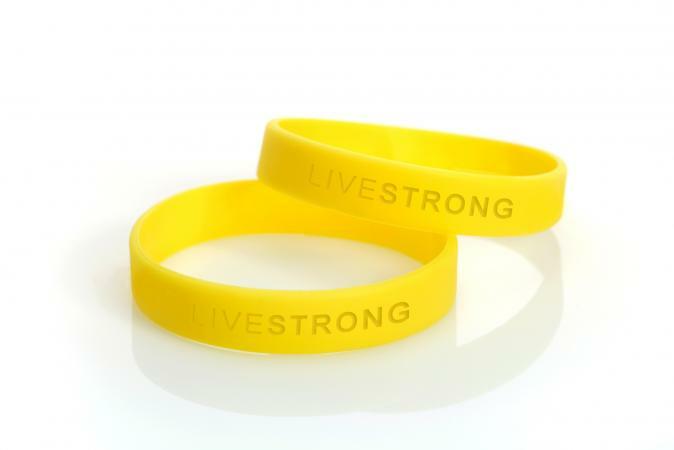 You can purchase a pack of 10 bands for $10 at the LIVESTRONG store. The Foundation's website has information for anyone affected by cancer. This means for those living with the disease and those experiencing it through a loved one. There is a Lance Armstrong blog that give readers details on his life and experiences with being a cancer survivor. In addition, there are resources on the site that can help those understand more about how to live with cancer and find the support they need. The Foundation is a valuable resource for those needing support to face the challenges of living with cancer. The inspiration that Lance Armstrong can give those with cancer is unique and inspirational. He knows first-hand what it takes to be a survivor and want to share that with the world.